Singers for Hire is a unique Wedding Entertainment Company based in Ireland. We exist because of Marco. Marco is a singing chef. A what? Yes, you read correctly a Singing Chef. His first “Singing Chef” performance was in the Maritim Hotel, Gelsenkirchen, Germany on New Year’s Eve in 2003. Singers For Hire was established as a Wedding entertainment Company in Ireland on the strength of his popularity when he relocated here in 2006. Since then, Marco, who has been singing professionally for 25 years, on the musical theatre, then the opera stage and his opera singing waiters have entertained clients in Ireland, London, Italy, Germany, France, New York & California, Dubai, Abu Dhabi, Sydney (where our sister company was established in 2012), as well as Canada, India and China. We’re a growing wedding entertainment company at 5000 shows and counting…. We’re not just a Wedding Entertainment Company but can provide you with musical entertainment, singing waiters and a variety of singers for any event. Singers for hire present a broad repertoire of songs from Broadway, to musical theatre and classical. The original one man show – The hard working Mediterranean chef “Marco” (who has the most ridiculous taste in trousers and footwear!) is on his last night in the hotel. He wants to check that everything is to the wedding guests’ expectations. While he has the microphone he would like to thank his employers. He’s moving to Las Vegas to pursue a career as an Elvis impersonator – of course everyone wants him to sing but no-one expects what happens next…. Imagine your guests’ surprise and delight when our opera singing waiters burst into song…. From our vast repertoire, set lists are compiled to between 25 and 40 minutes featuring a variety of popular and fun opera, swing and Broadway hits. Audience interaction is part of the job. As a professional Wedding Entertainment Company Singers for Hire are here to help you. 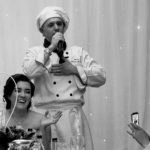 If you would like to know more about our wedding and event entertainment options, singing waiters or chefs and how you can add a wow to your next big event. Then please drop us an email or you could give us a call. With numerous options to offer you, we will provide you with the perfect answer to your entertainment queries. When you are looking for a fun and unique entertainment for your corporate or personal function call us. Then you can sit back and relax and let the professionals at Ireland’s leading Wedding Entertainment Company Singers for Hire turn your event into a celebration. Have a great night accompanied by the hits from the Rat Pack, the Three Tenors, Elvis and more.